This isn’t a very long post. In fact, I’m pretty sure it’s really just an excuse to look at these pretty pictures. It’s about dressing tables. 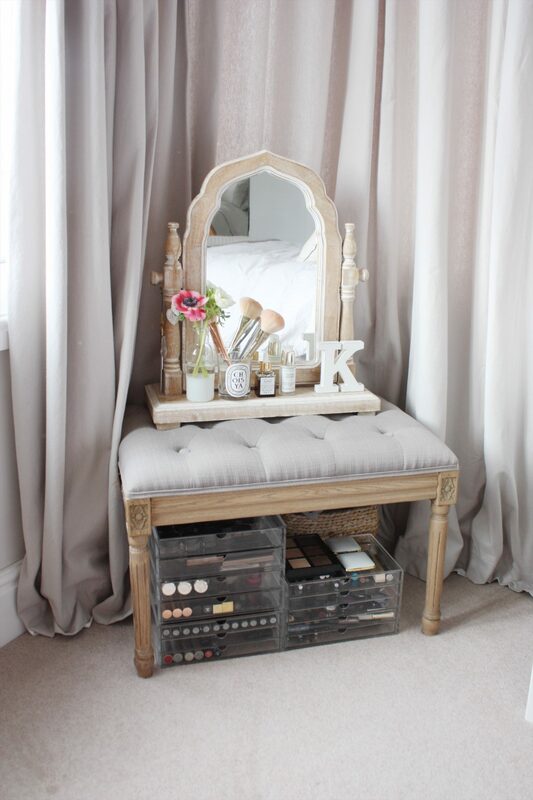 Or actually, not having a dressing table. While I continue the search for the perfect (probably non existent) piece of furniture, I have kind of mocked-up a dressing ‘corner’ consisting of an upholstered footstool and mirror. The only downside to this is the fact that I sit on the floor. But then if I’m honest, I think I prefer it that way. 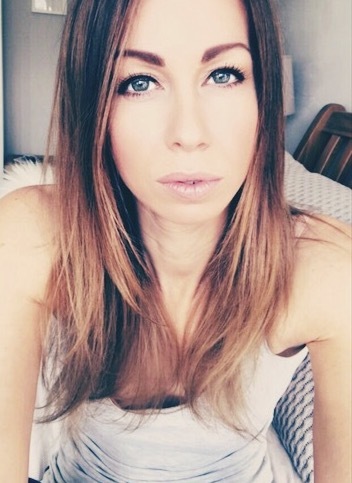 When I’m really going to town with make-up, I like to spread it all out so I would probably choose to sit on the floor anyway! 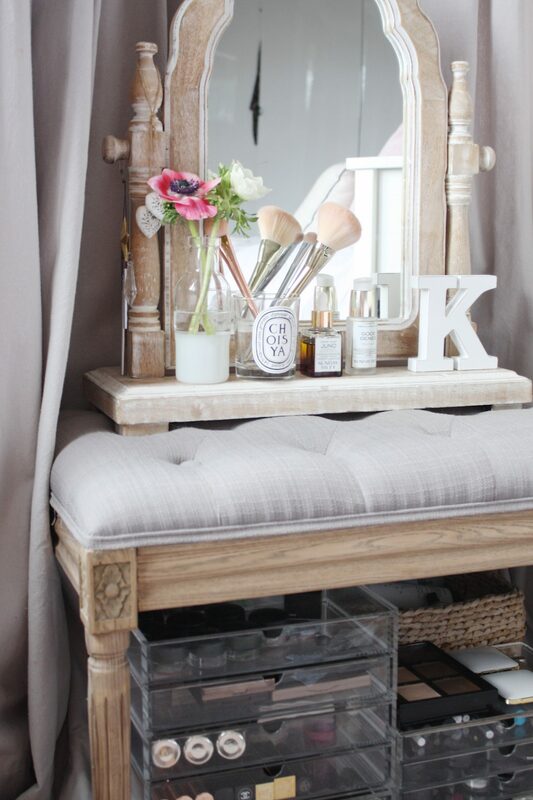 So, I’m not even sure if I had a stool at a proper dressing table I would actually use it! Storage wise, my go to for make-up is the Muji Perspex box range. I also use them for jewellrey. They come in lots of different combinations, look really neat and tidy and because they are clear, they are great for knowing where things are. I’m a bit OCD and so like all the products to be lined up nicely! 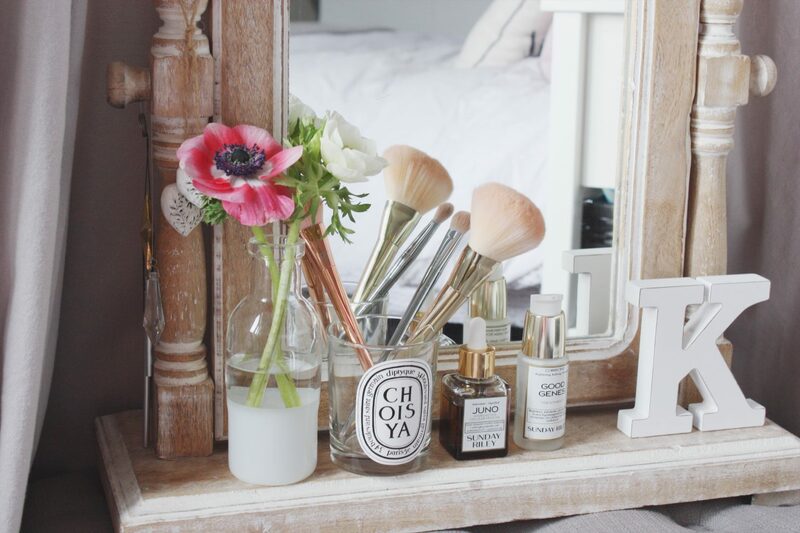 I stack a few of these perspex boxes with some baskets under the footstool for my most used products and then place some ‘pretties’ around the mirror to make it all look lovely. I put my everyday skincare products on the top so that they are within easy reach and handily the packaging on this little dream team is beautiful so I don’t mind them being on display (Current dream team: Omoraviza moisturizer, Sunday Riley ‘Juno’ night oil and ‘Good Genes’ serum) post on these coming soon. 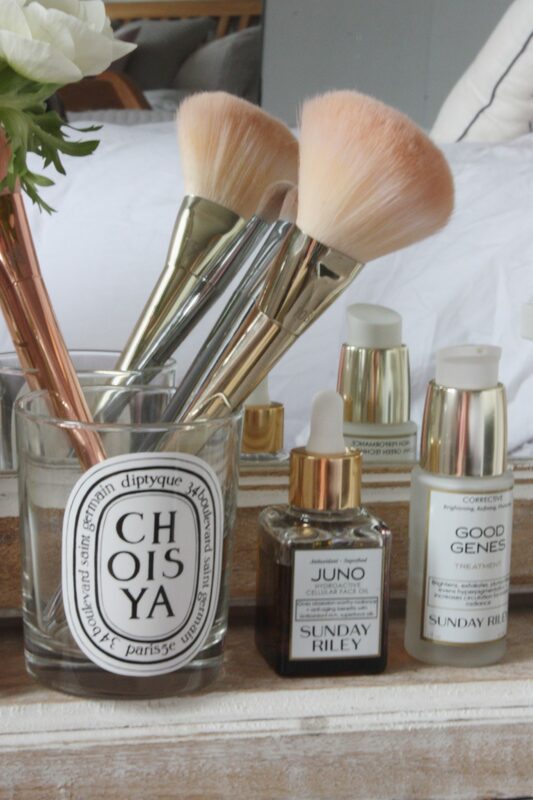 Like lots of people, I find that any empty Diptyque candle makes the ideal brush holder and the reusability factor goes some way to justifying a Diptyque purchase! The brushes I keep out on display are the swanky ‘Bold Metals’ by Real Techniques. I love these brushes and while the bold metals are a little pricey, just look at them. Worth every penny. The final touch is a tiny vase with one or two flowers I take out of my weekly flower hoard and voila! Not bad huh? I think us girls like to have our little fancy areas, much like men who have their sheds or garages and I’m pretty please with mine. Only other downside, its Pug height and pugs sneeze. So my other essential is some dettol wipes – totally ruined the vibe! I also sit on the floor to do my make up!